I think tweed is classic material for jackets. Suits might be a bit too much. But I have had a few Pendleton wool tweed jackets in my time. And;well my opinion of ale is no secret. You have some happy pictures. They make me happy. 🙂 A bit hot for tweed right now though, eh? Never too hot for ale. I think they are all thrilled to be who they are, Kerbey. The ale and the tweed are superffous to the they. are they on a train? I would like what they are drinking. It does look like a train, now that you say that. But it was just a campus hang-out. It looks like draft beer to me. I just wonder why that old woman escaped from the home to steal their napkins. At least one of the women has a cigarette, and I think that’s a pipe on the corner of the table. No food — just beer, tobacco, and Coca-Cola. And everyone looks happy. I noticed that, too. Why clutter up your fun with food? It absorbs the alcohol, and then what’s the point? 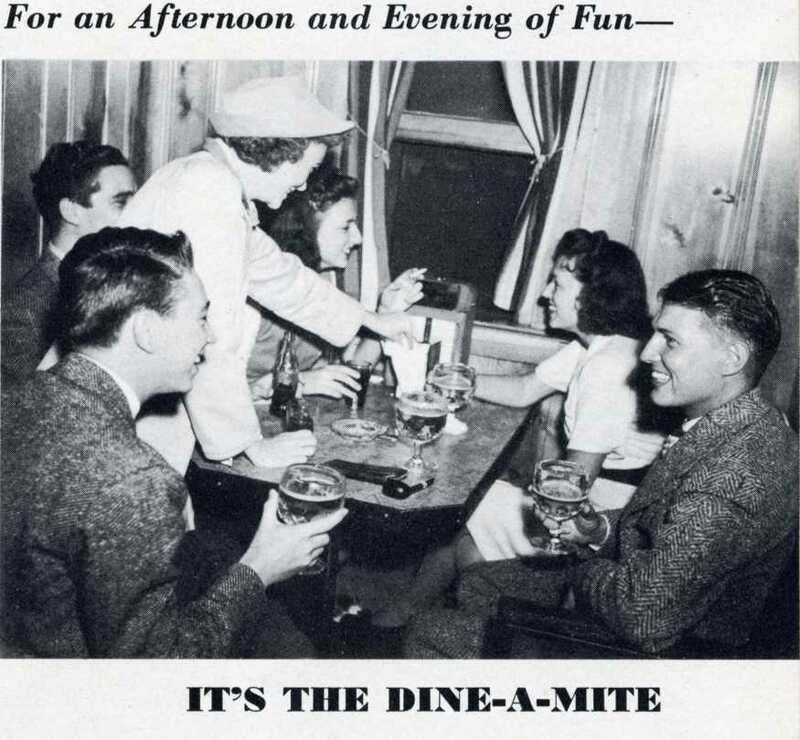 You could eat good food and dance at the Dine-a-Mite. Wilt Chamberlain ate there and helped integrate it. Is that so? And then he told JJ to use dyn-o-mite on “Good Times”? I just regressed to 1974.